This line-up of Fripp, Belew, Levin and Bruford were originally called Discipline. 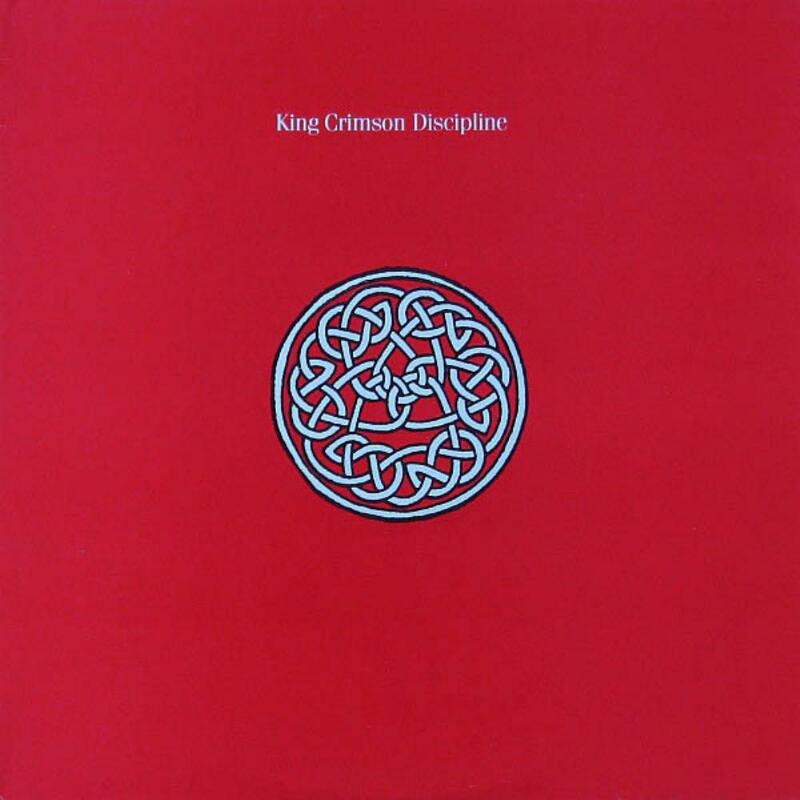 For whatever reason, Fripp decided the name should be changed to King Crimson. He asked Tony Levin what he thought and Tony responded that it was fine with him because he never liked the name Discipline anyway. There are those who believe that this group should not have been called King Crimson. Hell, there are some who believe that nothing after Islands should be labelled 'King Crimson'. Fripp and Levin both worked together on Peter Gabriel's solo albums. Belew and Fripp both appeared on David Bowie and Talking Heads albums. Bruford is back working with Fripp again. Some dismiss this album as some kind of Talking Heads rip-off. The T-Heads never did anything as experimental as "Indiscipline" nor will you find any drumming on their albums which comes close to what Bruford is doing here. If this album sounds like Talking Heads then all these years I've been listening to the wrong group with the same name. This follows on the heels of Fripp's experimental New Wave band The League Of Gentlemen. On the original album cover was a Celtic knot that, unknown to the band, was actually copyrighted; on recent CD versions the design has been changed. On this album begins the interlocking twin guitars that KC would continue to use in the next two decades. Roland guitar synths are used and Levin plays his Chapman Stick which he was usuing on Gabriel's albums. Bruford is not yet using electronic percussion. These compositions are pretty intricate and do not leave a lot of room for improvisation. However, one of the stand out tracks here, the instrumental "The Sheltering Sky", was originally a group improv which was recorded, then transcribed and re-recorded in the studio. This track has an almost tropical island vibe. Love the Stick and guitar synth here. Some cool sounds after 3 minutes. These songs were much better in concert without much deviation from the studio versions. One of the songs that was performed slightly different live was the opener "Elephant Talk." This is the only song that somewhat resembles T-Heads due to Belew's Byrne-like vocals. The lyrics are Adrian reciting different words in alphabetical order. He does some elephant sounds on his guitar. Love the solo, being both atonal and melodic at the same time. The last and title track is my least favourite song here but it's still good. The music is very, uh, disciplined. No room for improvisation. "Frame By Frame" is a highlight. Bruford really shines on this song with some African influenced drumming. Features Levin on back up vocals. "Matte Kudasai" is apparently Japanese for "please wait." Beautiful song. Love Belew's guitar playing and the gorgeous guitar arpeggios. The original version of this album had some guitar playing from Fripp on this song that was lated edited out on the first CD versions. It is now available as a bonus track on the most recent editions of the CD. I'm used to the version on the 1989 "definitive edition"(ha!) CD with Fripp's parts removed. "Indiscipline" is just something else; the most experimetal song on the album. Not many were doing stuff like this in the early 1980s. Bruford drums like a madman at times. Love the sustained guitar notes. The lyrics are very weird with everything being referred to as "it." The song alternates between a vocals and Stick section with more dissonant, noisy sections. "Thela Hun Ginjeet" is an anagram of 'heat in the jungle', which was the original title but Fripp didn't like it. This song is based on a tape recording Belew made about crime in the city. He recounts what happened to him as he attempted to do this. Interesting story. The music is based around a repeated Stick line. Bruford does some more African inspired drumming here. I love what the guitar is doing after 5 minutes. In addition to Adrian telling his story, there is some good singing on this track as well. No matter what you think about this album, you cannot deny these guys were trying to do something new. Compare this to some of what their 'prog' contemporaries were doing at the same time. Fripp hates the term "progressive" and would do whatever he could to distance himself from the 'dinosaur' bands. To me, this is the last KC album worth owning. Everything after this just seems to be recycled ideas. Apart from this, the only other '80s era release worth hearing is the live album Absent Lovers. This gets 4 stars.